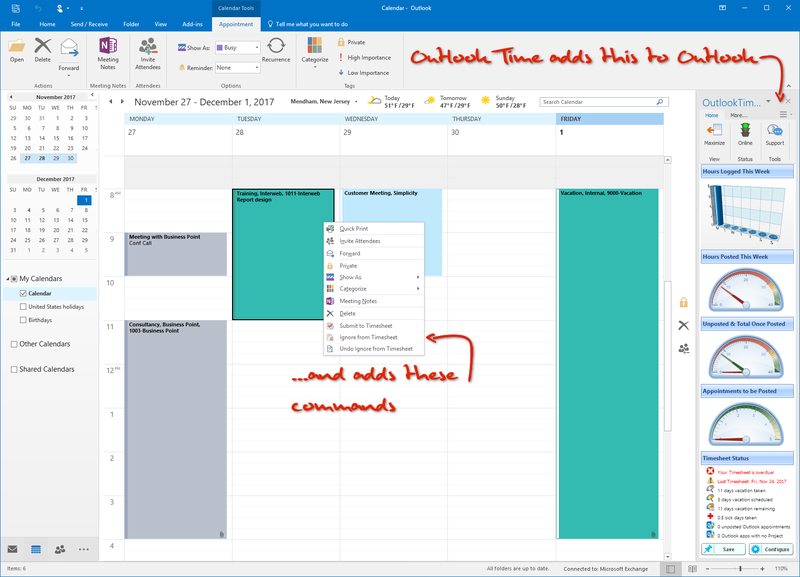 OutlookTime adds time tracking facilities to Outlook so you can track time from your Outlook Appointments. The real-time dashboard shows timesheet progress and appointments waiting to be posted to your timesheet. Notification center shows timesheet status and alerts – personal time off taken, vacation remaining, late timesheet alerts etc. OutlookTime can colorize appointments to show which ones are ready to post. Green ones are ready to post, grey ones have already been posted. If you use Outlook Categories, you’ll love this – you can allocate a customer / project to your categories, then post them to your timesheet. It takes seconds. OutlookTime® is a outlook time tracking system and timesheet reporter that turns outlook appointments into timesheets and outlook into a outlook time tracking and outlook time tracker system! Outlook time tracking is simple, easy, fast and saves users hours each week. . OutlookTime® outlook timesheet. Outlook time tracker provides Outlook 2016 time tracking, Outlook 2013 time tracking, Outlook 2010 time tracking and Outlook 2007 time tracking. What Outlook users have been waiting for! Outlook time tracking system turns Outlook appointments into timesheets and save hours each week! OutlookTime® runs inside Outlook and allows users to allocate customer and/or project information to their appointments (and emails), then post them to their timesheet. It really is that simple and that easy! OutlookTime® does not change the way you use Outlook, is so easy to use that no training is required. The system works with Outlook 2016, 2013, 2010 & 2007 and starts from as little as $8 per month per person. If you use Outlook and need time tracking, OutlookTime® will save users hours each week, increase the accuracy of timesheets, and pay for itself in minutes. Yes, I’d like to learn more about time tracking with Outlook. Not only is it easy to enter timesheets with OutlookTime®, analyzing timesheet data is easy too. Timesheet data is consolidated from all OutlookTime® users which you can access through a variety of reporting tools. All editions include a library of standard reports which can be viewed, printed, or exported to Excel, PDF, and email. The Pro and Enterprise editions also include our unique drill down reporting tools, automated alerts (such as late or missing timesheets), dashboard reports as well as custom reporting to perfectly match your reporting needs. The choice is yours. Your Outlook time tracker can even start in the Cloud, then move to On-Premise, or vice versa. What Versions of Outlook does it Support? All Timewatch® products include a host of self-learning tools to allow customers to learn and implement our solutions themselves. We can also provide services such as training, implementation, consultancy, and customization when required. OutlookTime® is designed to be able to adapt as your needs change: upgrade to a more advanced OutlookTime® edition (there are three versions, upgrade to Time® for more advanced timesheet entry, to Time®&Money to add costing & charging, or Time&Space to add costing, charging, billing, and scheduling. All Timewatch® products include a free Learning Center with free training videos, tips and free support center. We also provide professional training and implementation services, which we recommend for Pro and Enterprise systems due to their higher levels of configurability. Yes! All products include a free support center and help desk system built in. Once you have decided upon your configuration and any professional services, we can usually get you up and running the same day. Although Outlook time tracking is available in the Pro and Enterprise systems, they are both highly configurable and require knowledge and experience to configure. A blind trial is not applicable. However, we are happy to work with you to review your requirements and configure a system to meet your needs which you can experience in a test drive or demo. Yes. All systems are available in the Cloud or for installation on your own servers. Yes, there are discounts for one-, two-, and three-year terms, volume discounts on the enterprise range, and we often offer promotions that you may be eligible for. Contact us for details. If you need more power or flexibility, the next step up is our Time®&Money system. This includes advanced timesheet facilities, expenses entry, cost and charge rating systems, and optional multi-currency and billing options. it can help your organization please do not hesitate to ask.